This summer has had some remarkably hot days and our current heatwave has lasted for multiple weeks. Hopefully you've been diligent about drinking lots of water over this period but are you making sure your pets can do the same? As pet owners, it's up to us to make sure that our pets have regular access to clean water to help combat the forces of dehydration, which can be a significant threat on hot summer days. As with all animals, most bodily functions and processes are dependent on the proper balance of H2O and other chemicals, and imbalances can cause the body to begin to shutdown. 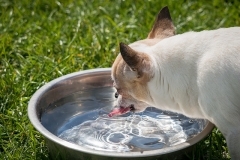 Drinking water is an essential part of staving off heatstroke, a real danger for pets during heatwaves, by helping to regulate body temperature, heart rate and blood pressure. Whether at home, on the road or on a walk, bring water for both yourself and your pets, especially when it's hot out. For more questions about good hydration or how to spot heatstroke, contact your local veterinarian today.